Denver, CO – [UPDATE: Right to Rest failed to pass vote in Colorado Legislature, full livestream below – 4.20.17] On Wednesday, April 5, 2017, after a day and a half of testimony, the jury for Denver’s first camping ban trial found the three co-defendants guilty. Jerry Burton and Randy Russell were each given a 6-month probation and ordered to complete 30 hours of community service, while Terese Howard has a 1-year probation and has to complete 60 hours of community service. On the morning of Monday, November 28, 2016, Burton and Russell were cited for “illegal camping.” Their survival gear, including tents and sleeping bags, were confiscated as evidence. On the evening of November 28, Burton and Russell were, for the second time that day, cited in violation of the camping ban. Howard was cited her first ticket of the day that evening. Burton has decided that he is going to appeal his conviction. Although the city of Denver was prosecuting the three co-defendants for violating this ordinance, the prosecuting attorneys successfully instituted a limitation in the trial so that only part of the ordinance could be read and shown to the jury. It shall be unlawful for any person to camp upon any private [or public] property without the express written consent of the property owner or the owner’s agent, and only in such locations where camping may be conducted in accordance with any other applicable city law. Jason Flores-Williams, the defense attorney, argued against withholding the majority of the text of the ordinance from the jury. Part of the ordinance that the prosecuting attorneys, Rebekah Watada and Brad Whitfield, limited the jury from seeing, requires officers to attempt to determine if someone is in need of medical care, or other help, before enforcing the ordinance. If they don’t make an effort to find out if they are doing OK, or in need of treatment, they can’t arrest or enforce,” Flores-Williams said. Removing that part of the ordinance during this trial meant that the prosecuting attorneys did not have to prove beyond a reasonable doubt that the officers followed the enforcement protocols and were therefore legally citing the defendants. Instead, all the prosecution had to prove beyond a reasonable doubt was that the three defendants broke the law. The defendants openly stated that they broke the law, however, because to them, the law prohibits them from surviving, so in order to survive, they needed to break it. Burton, a military veteran with Degenerative Bone Disease, had to go to the Veterans Affairs Hospital after receiving the second camping ban ticket because his joints were locking up from the cold weather and he was not legally allowed to rest and warm up under his blankets and sleeping bag outside. From the beginning of jury selection on Monday, prosecutors Watada and Whitfield voiced that they wanted the potential jurors to leave their “social commentary” at the door. They told the potential jurors to decide whether or not the defendants violated the law, the part of the law that the prosecutors allowed the jury to see, and not whether the law is fair or just. Watada and Whitfield also successfully instituted other limitations to the trial, including not allowing the defense to mention jury nullification, not allowing the defense to go into the constitutionality of the ordinance, not allowing the defense to mention the class-action lawsuit, and not allowing the defense to argue that the ordinance criminalizes people without housing. When Flores-Williams attempted to prove the inhumanity of the ordinance, he was constantly objected to. However, during his questioning of Officer Samuel Grier, he got him to acknowledge he uses a bullhorn to wake people up in the morning. Those who are against the camping ban insist that a dignified and humane alternative to criminalizing homelessness is to provide truly affordable housing. As we reported almost a year ago in our article on Denver’s affordable housing, according to “The Self-Sufficiency Standard For Colorado 2015” report by Colorado Center on Law and Policy, the cost of living across the state has outpaced wages by a ratio of 3:1 over the last fourteen years. Much of this increase is from a lack of truly affordable housing, where the average rental unit in Denver rests at a prohibitively high average of $1,291 per month, following double-digit percentage growth year after year. To afford this average rental price in the Denver metro area, renters need to make $35 an hour, or almost 4 and a 1/2 times Colorado’s minimum wage. Thus, increasing and fueling the cycle of poverty and homelessness for many Denver residents. The Colorado Village Collaborative, a coalition of service providers, advocates, foundations, business leaders, congregations, and people living on the streets, is behind Denver’s first tiny home village called Beloved Community Village. The village will provide 11 homes, a common meeting and kitchen space, community gardens, showers and restrooms for up to 22 people who currently do not have permanent housing. 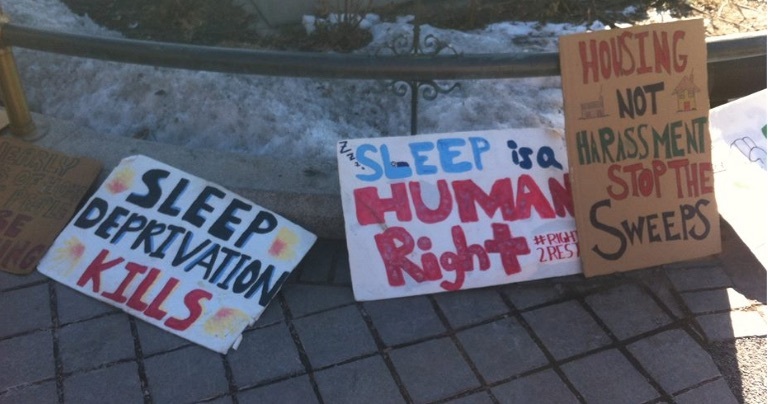 On Wednesday, April 19, 2017, the Homeless Bill of Rights (HBR), which would have essentially repealed the Unauthorized Camping Ordinance if passed, was heard for the third time in the Colorado Legislature as HB 17-1314. By a vote of eight to five, this bill failed to pass. We spoke with Marcus Hyde, a member of DHOL who has been campaigning for the HBR, or Right to Rest Act, since its first introduction in 2015. UR: This is the 3rd year the Homeless Bill of Rights, also known as the Right to Rest Act, is being introduced to the CO Legislature. What does that mean for you and other advocates of the bill? Hyde: We know that these laws are meant to help push development by using police to scare and intimidate, harass and arrest anyone that developers don’t want to see in front of their new condos. The Right to Rest Act is about making sure that no one gets treated like a criminal just because of their housing status, or because they are the ‘wrong kind of person.’ It’s about making sure that city officials across the state have to respect the rights of all Colorado residents, and not just the people they like. We’ve seen this same kind of criminalization before. We used to call it Jim Crow, or Ugly Laws and Sundown Town laws, now we call it camping bans and loitering. . . The criminalization of homelessness is cruel, ineffective, has been declared unconstitutional by the Department of Justice, and it’s an awfully expensive habit for cities to keep up. Not only is jail one of the most expensive forms of housing for tax payers to pay for, but on top of that, the endless police raids of homeless encampments around the state, and the countless hours of court procedures wind up costing tax payers millions of dollars every year. . .
Last year, the Right to Rest Act was voted down by a margin of one vote. The year before we lost by five votes. Every year we come back stronger, and the legislators get a little less apprehensive about doing the right thing. So we hope that this year we will have the Right to Rest and we can actually start putting all the resources we currently put into criminalization into actual solutions. UR: The hearing is on April 19, 2017. What will that day look like? What committees and approvals does it need to get passed? Is the hearing only that day? Hyde: The Right to Rest Act will be introduced into the State House Local Government Committee on April 19th at 1:30 pm. If it passes out of that committee, it will get to the Appropriations Committee, since it has a fiscal note which suggests how much it will cost the public/state if the bill is passed. Then if passed out of that committee, it goes to the House Floor where it will also be voted on. If it gets approved by the majority of the House, then it will have a similar path to get through the State Senate. The Senate would need to find a sponsor for the bill in order for it to be introduced. If it’s not introduced into both houses, it’s a dead bill. If it’s assigned to a committee, it will get voted on again, then go back to the floor for the general membership to vote on it. Again, the senate could send it to appropriations. Every time a bill is in a committee, it can be amended. Customarily bills aren’t amended on the house or senate floor because there’s too many people to debate every detail of the bill. If the two legislative bodies come up with two bills that look different because of amendments, then it’s up to the original sponsor to make a call on what to do – call a special session to work out differences between the two bodies, pull the bill and kill it, or accept the version created by the other legislative body and have it voted on again within his or her own legislative body as amended. Then if it somehow survives and is passed, then the governor has to sign the law. The hearing will likely only last one day. If it gets moved onto the house floor, there will be a later date set for a debate on the floor. UR: Why is this bill important? Hyde: Because we’ll never end homelessness if we treat homeless people like the problem, instead of addressing the filthy rotten system that keeps perpetuating poverty. As long as being poor is a crime, we will have jails full of criminals and mass homelessness. UR: Anything else you’d like to add? Hyde: Homelessness ends with a home, period. Unicorn Riot will continue coverage of the Homeless Bill of Rights, of the class-action lawsuit against Denver, and other issues affecting Denver’s unhoused population.